Portugese food is becoming increasingly popular in India. In Mumbai there are these restaurants that exclusively serve Portugese delights. I came across this rare kind of salad on a tv show called “Cooking isnt rocket science” where Manju Malhi, a popular chef from Britain, shows us how to whisk up dishes from around the globe with utmost ease. 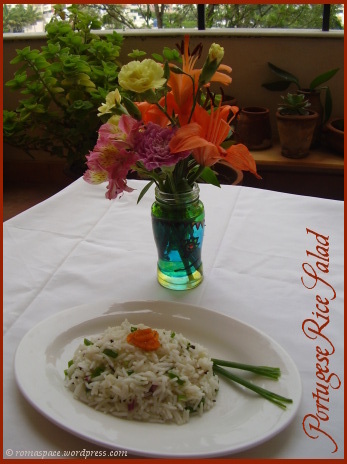 Since we dont have the long grained rice that is used originally in Portugese dishes we can substitute it with Indian Basmati which works just as well. I liked the flavor of this salad. It was somewhat like a fried rice just that its flavors are more raw and strong. This is my entry to mixed rice varieties event hosted by Easycrafts. Mix the ingredients for the dressing in a mixing bowl. Let it rest for a while so that the dressing seeps into the spring onions well. Now mix the dressing into the rice. Rice looks delicious. It is same asour fried rice with the addition of vinegar. More than the food itself, the ambience brings happy thoughts into one’s mind. Nice picture.